The Senior Championships saw unanimous decisions of the experienced judge's panel. Beautiful bay Aireonna WW accomplished Gold Champion Senior Mare while Polish bred Pero gained the same honours for Senior Stallion. For most people, the United Arab Emirates means iconic high rises, city-sized shopping malls, excellent hotels for sport and leisure as well as splendid beach resorts. Beyond the lavish splendor, the country reveals undreamt-of stimuli and the authentic charm of which we as surprised observers cannot resist. Fujairah, for instance, is a favorite weekend escape, an Emirate on the Gulf of Oman, and part of the UAE with the fastest growing Arabian horse community worldwide. No wonder, it needed an exciting five-day show event to celebrate 466 Arabian horses against the backdrop of the historical Fujairah Fort. Under the kind patronage of His Highness Sheikh Mohammed bin Hamad Al Sharqi guests, an international judges panel and participants were warmly welcomed with the typical national hospitality. Bred by Deborah and Patrick Omara, USA, the elegant Marhabbah daughter Aireonna WW is proudly owned by Al Hawajer Stud. Being out of Arwen WW, by Da Vinci FM, Aireonna WW’s siblings been marketed all over the world including Dubai, Kuwait, and Mexico. Silver Champion Senior Mare was gained by D Wajnah, by Selket Marquis, bred by Dubai Arabian Horse Stud and owned by Jumah Mohammed Hamdi Bin Hamdi Alshemeili. Bronze-winning Waliya, by AV Montoya, was bred by the Dorssers family, Netherlands, and is now owned by Al Jazeera Arabian Horse Stud. Bold trotting Pero, bred by Janow Podlaski, originates from a great pairing of excellent champions. His sire Poganin represents the sire line of Laheeb – Imperial Imdal, making Pero a paternal halfbrother to European Res. Champion Stallion Kabsztad. Pero’s dam Perora, by Eldon, traces back to the wonderful Pentoda out of Piewica. For sure, Bin Humaila Arabian Horse Stud is proud to own such a glistening white treasure like Pero. WH Justice son Ammar El Mabrouka, bred by Rikke Blaake Rasmussen, Denmark, garnered Silver for his owner Sheikha Maryam Bint Mohammed Rashed Al Maktoum. 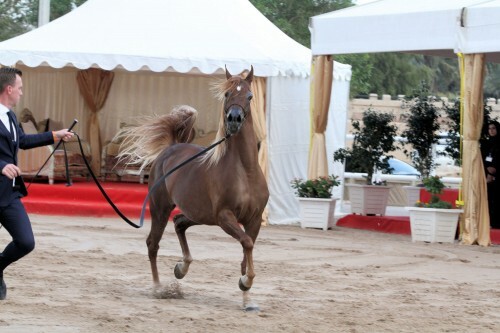 Bronze went to Shadan Al Hawajer, by Yas Al Hawajer, bred by Al Hawajer Stud and owned by Almuntheri Arabian Horse Stud. Al Hawajer Stud celebrated a double success in the yearling filly championship with RFI Farid daughter Betol Al Hawajer (out of aforementioned Aireonna WW) winning Gold, while her stablemate Mai Al Hawajer, by Kanz Al Bidayer, gained Silver. Bronze was given to D Gharasheeb, by Kahil Al Shaqab, bred and owned by Dubai Arabian Horse Stud. A fantastic success for those fine fillies dominating the competition in seven yearling filly classes. Talking about Dubai Arabian Horse Stud: it also celebrated a double success as a breeder, winning Gold Champion Yearling Colt with D Mahboob, by D Mishary, and Gold Champion Junior Colts with D Maysoor, by FA El Rasheem, the later is owned by Alfalah Arabian Horse Stud. Especially the yearling colts saw a tough competition with six classes filled with upcoming young horses so it was a great success to gain a medal in the end. Galardo J sired the Silver Champion Yearling Colt Bashir Al Bashir, bred by Ajman Stud and owned by Alhindal Stud, while another D Mishary son garnered Bronze: AZ Awzan, bred and owned by Abdelaziz Hussain Mohamed Almarzooqi. Silver Champion Junior Colt was awarded to the Emerald J son Dargham Alhawajer, owned by Ras Al Khaimah Stud, while the Bronze winner Rayan Al Muawd, by Kahil Al Shaqab, is owned by Mohthab Arabian Horse Stud. Last but not least the junior fillies. The first show, first win for Sundos Albidayer, a steel grey FA El Rasheem daughter out of San Jose Alfonsina. This three years old not only gained the Highest Points of all fillies but also Gold Champion Junior Filly for her proud breeder Sheikh Mohammed Saoud Sultan Al Qassimi of Albidayer Stud. And Sundos Albidayer was not the only medallist for her breeder as her stablemate Anwaar Albidayer, by SMA Magic One accomplished Bronze. The Silver Champion Junior Filly, Derosa GA, by Da Finci FM, was bred by Stillwater Arabians, USA, and is owned by Al Saqran Stud. Like in 2016, Arabian Horse Results was a Media Partner for the Emirates Arabian Horse Society under the wise guidance of Essam Abdulla and we wish to thank the Emirates Arabian Horse Society and the show organizing team for partnering with Arabian Horse Results.